It’s the day before Thanksgiving, so I’m going to be brief and promise this year not to wing it with the holiday puns. Everyone is too busy stuffing holiday bins trying to get a leg up for the upcoming black Friday sales to suffer the gobble gobble jokes. If you’ve been keeping a-breast of our weekly sales reports then you’ve noticed the fowl downward direction that our YTD comparisons have been taking since the week of 10-23. Oh how the mighty have tumbled into a cranberry bog! Country album sales YTD have been carved from a surplus of 9.3% one month ago, to our present 1.4% increase. All genre sales are doing slightly better, still ahead 2.8%. The squashed numbers are easy to explain, we just haven’t had enough product this year to match the plate full of releases we had at this time last year, and that’s it. For example, last year at this time we had debuts from Rascal Flatts and Keith Urban who together sold almost 325,000 units. Still we should be Thankful because there are encouraging signs on the horizon especially in the tracks department, but wait let’s not jump to dessert before the main course. Country album sales are topped by Idol phenom Scotty McCreery who shifted over 33,000 units to land at No. 1. Lady Antebellum (32,000), Miranda Lambert (28,000), Luke Bryan (22,000) and Jason Aldean (21,000) round out the Top 5. 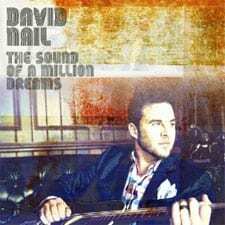 David Nail has the only Top 10 country album debut this week scanning about 13,000. Taylor Swift’s CD/DVD live package is in the racks now, so we’ll get some numbers next week. 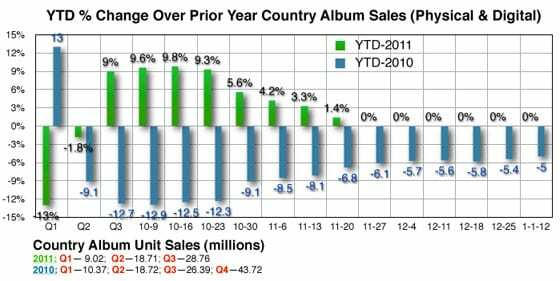 No idea where that will land, but it’s going to be hard to offset the continued decline in country’s YTD album tally. For those counting we have six more weeks to complete the year. To equal last year’s total (43.720 million) we need to sell an additional 9.2214 million units or an average of 1.535 million for each of the remaining six weeks. (Last week we sold 829k). YTD country has sold 128 million tracks. That’s a TEA of almost 13 million albums, almost a 40% increase if added to country album sales. That is significant and either is or should be profitable. Some people will find this upsetting to hear, but get over it—tracks are the new albums with respect to sales. Need more convincing? This week’s top five country track positions were filled by Toby Keith “Red Solo Cup” (58k), Luke Bryan “…Night To End” (56k), Taylor Swift “Movie” (52k), “Ours” (47k), and Blake Shelton “God Gave Me You” (42k). Added together that is 255,000 tracks or over 25,000 TEA albums. Total country tracks this week hit 2.56 million or a quarter million albums! Have you tried the new Google Music offering yet? Join me at +davidmross or tweet @davidmross and let me know your reaction. A special HAPPY HOLIDAYS to all. Your readership means so much to me. Thank You so much for your support. Best to you and yours—have a great holiday!